David is a freelance developer living in South Florida. 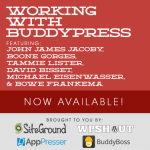 He primarily does WordPress/BuddyPress/PHP work, and specializes in BuddyPress. In fact, he has had an obsession with creating cutting-edge BuddyPress sites and applications since BuddyPress 0.1. He’s also a speaker, conference organizer, and father of three.